The Quintessence of Tonkin, run by Tuan Chau Ha Noi JSC, impressed the judges of the Asia-Pacific Stevie Awards 2018 with images of peaceful landscapes and its depiction of the unique heritage of the northern region as well as Vietnamese history and culture from a contemporary perspective, which it portrayed with the help of hundreds of performers, an interactive stage, and state-of-the-art technology. The Silver prizes for this category went to Traditional become Modernism - Korea traditional theatre Miyaljeon by Seoul’s Dure Art, “Hoi An Memories” show at the Hoi An Theme Park in the central Vietnamese province of Quang Nam, and Toonation, a project by the Republic of Korea’s Toothlife Co. Ltd. The Bronze went to Hong Kong’s HGC Global Communications for their Launch of New eSports Online Platform project. The Quintessence of Tonkin highlights various elements of Vietnamese culture, such as folk singing, folk games, the worship of Mother Goddesses, and the daily life of farmers, portrayed in contemporary and innovative ways. The 60-minute show is held every day between 7.30 pm. and 8.30 pm. at Baara Land, Quoc Oai district, 25km west of Hanoi’s centre. The venue is near the Thay Pagoda, one of the oldest Buddhist pagodas in the country and a pilgrimage site during the lunar new year festival season. The spectacle draws inspiration from the pagoda’s spiritual history, with its story focusing on the founding of the pagoda by the venerable monk Tu Dao Hanh and the ancient union between religion and monarchy. A visit to the Thay Pagoda can be combined with a trip to see The Quintessence of Tonkin, contextualising both experiences. The water allows for a creative portrayal of the area’s cultural heritage, in the form of water puppetry and dragon boat racing, among others. 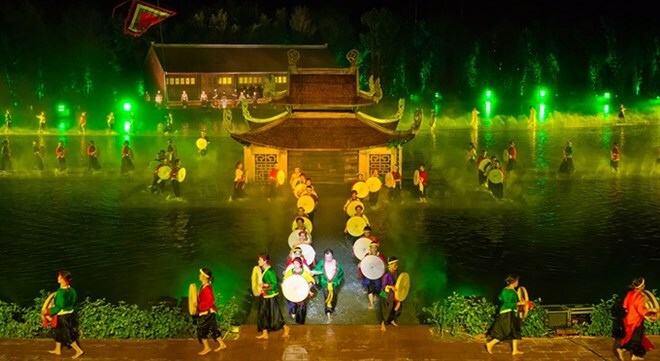 While performance art technicians were sourced to come up with a world class sound and lighting system, the show reflects the peaceful sounds of rural Vietnam, such as those that come from wooden drums, brass gongs, night crickets, and flowing water. The project also blends different elements of traditional music styles, including quan ho (love duets) and ca tru (ceremonial singing), both of which are now recognised by UNESCO as examples of intangible world heritage. The Stevie Awards are the world’s premier business awards, with the aim of recognising achievements in the workplace worldwide. The Asia-Pacific Stevie Awards are one of seven Stevie Awards competitions. The others are the International Business Awards, the German Stevie Awards, the American Business Awards, the Stevie Awards for Women in Business, the Stevie Awards for Great Employers, and the Stevie Awards for Sales & Customer Service. The Asia-Pacific Stevie Awards are open to all organisations in the 22 nations in the Asia-Pacific region. A number of Vietnamese companies also won in the Stevie awards this year, including the Hanoi Small and Medium Enterprise Association, which won the Silver Stevie Award for Innovative Management in Non-Profit Organisations or NGOs and the Bronze Stevie Award for Innovation in Non-Profit/NGO Events. DHL Express Vietnam from HCM City won the Gold Stevie Award for Excellence in Innovation in Business Product & Service Industries with More than 100 Employees and the Gold Stevie Award for the Innovative Use of Technology in Customer Service. VNPT Vinaphone Corporation from Hanoi won the Silver Stevie Award in the same category. VNPT Vinaphone Corporation in Hanoi also won the Gold Stevie Award for Excellence in Innovation in Health Care Industries with More than 100 Employees and a Bronze Stevie Award for Innovation in Brand Renovation / Re-Branding. Viettel Group also won the silver award for Innovation in Living, Learning, and Working Environments.